Friday, 11. 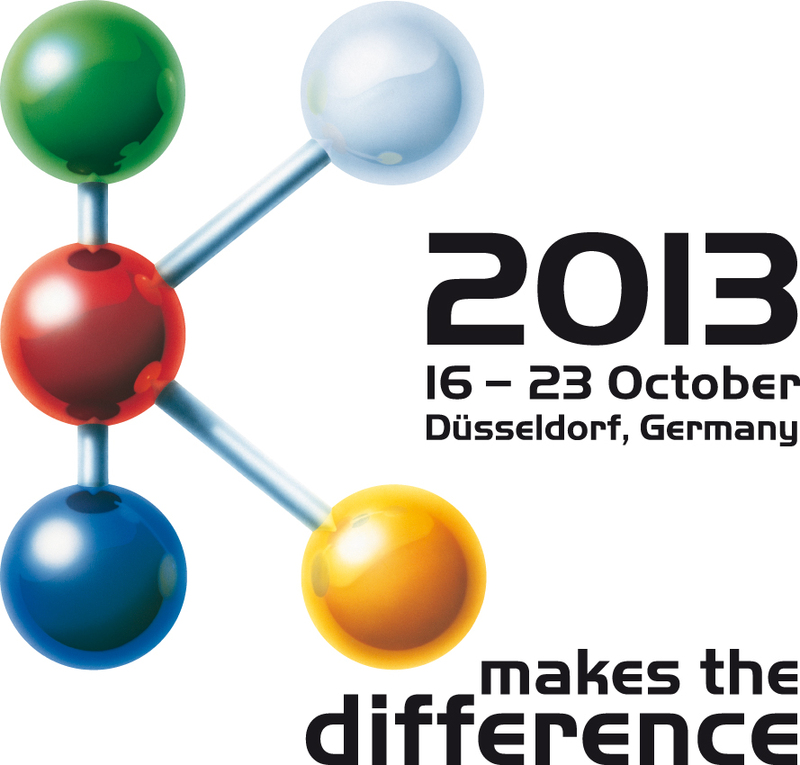 October 2013 Rhein Chemie Rheinau GmbH, a wholly owned subsidiary of Cologne-based specialty chemicals company LANXESS, will showcase solutions for the rubber and plastics industries at “K 2013” – the world’s largest trade show for plastics and rubber – from October 16 to 23, 2013, in Düsseldorf (LANXESS stand, C76, in Hall 6). Rhein Chemie Rheinau GmbH, a wholly owned subsidiary of Cologne-based specialty chemicals company LANXESS, will showcase solutions for the rubber and plastics industries at “K 2013” – the world’s largest trade show for plastics and rubber – from October 16 to 23, 2013, in Düsseldorf (LANXESS stand, C76, in Hall 6). As part of the publicly funded Innovation Alliance for Carbon Nanotubes, which receives public funding from Germany’s Federal Ministry of Education and Research (BMBF), Rhein Chemie Rheinau GmbH joined forces with Freudenberg Forschungsdienste SE & Co. KG and the German Institute of Rubber Technology for the CarboElast technology project. Rhein Chemie succeeded in developing a gentle dispersion process for the production of carbon nanotubes (CNT) master batches, initially for NBR. These innovative master batches are completely dust-free and far easier to incorporate into a compound than CNT powder (Rhenogran concept). They contribute to excellent mechanical reinforcement in the elastomer itself. Due to the low CNT proportions in the vulcanizate, the shear modulus G”max is subject to a dynamic mechanical loss more than 30 percent lower than for vulcanizates with conventional fillers and a comparable level of reinforcement (modulus 100 percent). With CNT master batches, it is therefore possible to produce high-strength compounds with excellent elasticity. • As part of LANXESS’ Green Mobility initiative, Rhein Chemie is reintroducing Rhenogran Geniplex-70 as a co-accelerator, crosslinking activator and blowing agent. It is an effective coagent for crosslinking weight-reduced elastomer components. Rhenogran Geniplex-70 is a crosslinking activator for sulfur vulcanization and a blowing agent activator that has been part of Rhein Chemie’s range of products for many years. Primarily used in blown EPDM profiles, it also acts as a blowing agent in its own right. This coagent is an option particularly attractive for automotive applications, because it helps reduce the weight of elastomer components. Rhenogran Geniplex-70 activates accelerators that are used to crosslink elastomers with sulfur. This increases the processing reliability of rubber compounds containing Rhenogran Geniplex-70 and results in more complete vulcanization. The physical characteristics of rubber items are not negatively affected. In some cases, they are even enhanced. When producing cellular rubber compounds, the blowing agents’ decomposition temperature is reduced. Rhenogran Geniplex-70 is ideal for use in EPDM and standard types of rubber, such as NR, SBR and NBR. It can be used in both expanded and solid rubber compounds. Rhenogran Geniplex-70 is particularly used in crosslinking systems that do not lead to the formation of dangerous N-nitrosamines. With the help of Rhenogran Geniplex-70, even accelerator systems made up of certain thiurams, carbamates and other accelerators that can lead to the formation of carcinogenic N-nitrosamines, can be combined without compromising on processing reliability or physical properties. Using Rhenogran Geniplex-70 in these accelerator systems significantly reduces the possibility of forming carcinogenic N-nitrosamines. It also makes the accelerators far more effective and optimizes usage properties. Rhenogran Geniplex-70 impresses in the production environment, too, combining high extrusion rates with profile surfaces of exceptional quality and low reject rates. Rhenoblend is Rhein Chemie’s new line of specialty elastomers. Rhenoblend grades are oil-extended mixtures of trans-polynorbornene, an elastomer with special characeristics. Rhenoblend can be used on its own or as a blend component to modify technical elastomer properties. It is supplied as granules and processed in internal mixers or on roller mills. Rhein Chemie’s technical service is happy to offer advice and recommendations on possible formulations. Rhein Chemie offers a variety of tire-making solutions with its comprehensive portfolio of eco-friendly Rhenodiv tire release agents. Rhenodiv permanent bladder coatings, which enable tires to be vulcanized without the need for tire spray solutions containing silicones, open up further possibilities for tire manufacturers to improve efficiency and quality. This is particularly beneficial when manufacturing highly complex products such as tires with run-flat, self-sealing and noise-reducing properties. Rhein Chemie offers a wide range of bladder sizes for all standard press types from a single source – from small bladders (Rhenoshape) for making go-kart tires to large ones for tires of earth moving vehicles. For many years now, moldings made of cast polyamide 6 and 12 have been used to successful effect in applications that need to satisfy the toughest demands. Such parts benefit from a straightforward manufacturing process and balanced physical and mechanical properties. They are also far lighter than metal components. This weight advantage makes cast polyamide the material of choice for new lightweight construction technologies that are becoming increasingly important in today’s vehicles. With Addonyl, Rhein Chemie offers all the additives needed to manufacture and modify cast polyamide from a single source. It can be used for everything from conventional stand casting to new lightweight construction concepts and innovative composites.